When I unpacked Denon’s new AVP-8000 THX certified, AC-3--compatible surround preamplifier/tuner I thought Denon had made a mistake. Although the box’s markings indicated the unit inside was an A/V preamplifier, the AVP-8000 was heavier than many A/V receivers. This solidly built quality was also reflected in Denon’s matching POA 8200 and POA-8300 2- and 3-channel THX-certified power amplifiers. In fact, this new Denon package is built more like high-end esoteric audio products than most home-theater gear. The AVP-8000’s extensive features and totally up-to-date technology befit the unit’s top-of-the-line status. Not only is the AVP-8000 THX certified, the preamp/tuner also has built-in Dolby AC-3 discrete digital surround decoding. You don’t need to mess with separate decoders and lots of connecting cables: simply plug your laserdisc player’s AC-3 RF output into the Denon and you’re ready to enjoy 5.1-channel discrete digital surround. Six audio/video inputs are provided, three of which are part of the A/V tape loops for connecting up to three VCRs. All video inputs and outputs appear on both composite video and S-video jacks. Atypically, the front panel lacks A/V input jacks. An analog tape loop is included, but sadly, you don’t get a phono input. If you want to play re cords with the AVP 8000, you can add an outboard phono stage, such as Audio Alchemy’s excellent $199 VAC-In The-Box. Two line-level audio inputs marked CD and AUX complete the AVP-8000’s impressive array of input/output connections. Although all the jacks are gold-plated, the CD and VDP (Video Disc Player) inputs are on higher-quality, chassis-mount RCA jacks. Line output for connecting the power amplifiers appears on six RCA jacks (front left, center, front right, surround left, surround right, subwoofer). Another line-level audio/video output is included for driving an amplifier that is part of a second-room system. In addition to the RF AC-3 input, the AVP-8000 features five standard digital inputs (two coaxial, three optical). These digital inputs let you connect source components with digital outputs (such as laserdisc players) directly to the AVP 8000’s digital processing circuitry, bypassing the laserdisc player’s digital-to-analog conversion electronics as well as the AVP 8000’s analog-to-digital converters. Eliminating these conversions results in purer sound. Overall, the AVP-8000 has the best user interface of any A/V preamplifier or receiver I’ve used. The initial setup is easy, and using the unit on a daily basis is simple. Despite the AVP-8000’s tremendous functionality, the unit’s front panel and re mote control are remarkably uncluttered. The AVP-8000 has just a few buttons, most of which are hidden behind a flip- down panel. A large knob controls the volume, which is displayed numerically in large red numbers as a positive or negative value in relation to TI-IX reference level. Input sources are selected by a rotary knob and indicated in the large fluorescent display both by name (“VCR 1,” for example) and by a small red LED above each of the source names. Bass and treble controls are on two knobs beneath the flip-down panel for easy adjustment; no complicated menu system and multiple commands are required just to turn down the treble a shade. The AVP-8000’s on-screen setup system makes it easy to configure the unit for your system. Rather than ask you to input technical information about the rest of your system, the AVP-8000 speaks your language. For example, you tell the AVP-8000 how far away each loudspeaker is from the listening position, and the preamplifier automatically adjusts the delay time to each loudspeaker. That’s a lot easier to understand than a command such as “Input delay time.” Similarly, rather than selecting crossover points for your loud speaker and subwoofer, the AVP-8000 simply asks you whether each of your loudspeakers is large or small, and if you have a subwoofer connected. The AVP 8000 uses this information to keep low bass out of small speakers. Another setup menu lets you specify which of the five digital inputs (plus the AC-3 input) is connected to which of your source components. A front-panel analog/digital switch selects between analog and digital inputs, and a “lock” LED lets you know when the AVP-8000 has locked to a digital source. The front- panel fluorescent display also indicates when a digital input signal is selected, reading “CD-Digital,” for example. These setup menus are accompanied by an icon-based, on-screen display that graphically shows the adjustments. A feature called ‘System Call’ lets you issue up to ten commands in succession from the remote control with a single but ton push. For example, you could pro gram System Call to turn on all the components of your system and configure them for laserdisc playback in Home THX mode—all at the touch of a single button. Another essential feature included with the AVP-8000 is an input trim control that prevents the unit’s input from being overloaded. (Correctly setting the input level adjustment on an A/V preamplifier or receiver is vital in order to get the best sound from your system. If the input level is too low, the preamplifier’s on- board analog-to-digital converter never sees a frill-scale signal, which unnecessarily degrades the signal-to-noise ratio and increases distortion. If the input level is too high, the A/D converter clips, introducing distortion during loud passages.) Note that when using digital inputs that bypass the preamplifier’s A/D converter, no input adjustment is necessary. You can also set the maximum bass level driving your loudspeakers to pre vent overdriving your main loudspeakers or subwoofer—an easy thing to do, particularly with AC-3 decoding. Last but not least, a “Cinema EQ” switch can be used to roll off the treble for overly bright film soundtracks, and a four-position dynamic range compressor can be invoked when decoding AC-3 sources. Seven DSP surround modes are provided with variable effects levels. As with DSP processing on all A/V pro ducts, I hope most users will stick with straight stereo for music playback and Pro Logic, Pro Logic/ THX, AC-3, or AC-3 decoding with TI-DC for film soundtracks. The AVP-8000 is the first processor on the market to offer the latter option. The remote is well laid out, with plenty of space between buttons, different shapes and colors to segregate functions, and a panel that covers little-used features. I could easily feel the master volume control’s large upward and downward pointing triangles, even in the dark. Moreover, the remote control works even when pointed well away from the AVP-8000. The AVP-8000 has a feature called RDS (Radio Data System), also known as “Smart Radio.” An RDS-equipped tuner allows you to decode and display RDS-encoded data (station call letters, music genre, etc.) transmitted along with an FM or AM broadcasts. Looking inside the AVP-8000, I was greatly impressed by its design and lay out. The unit looked more like an esoteric high-end product than a mass-market piece. The AVP-8000’s power sup ply—an important element in getting good sound—was massive for a preamplifier. The huge power transformer, lots of voltage regulators on heat sinks, and many filter capacitors point to a supply that was designed for sonic integrity, not just a power supply that “will do.” The digital-to-analog converters are 20-bit types for the front, center, and subwoofer channel, with 18-bit converters on the surround channels. The Pro- Logic decoding is performed digitally with DSP chips. The chassis is copper rather than steel for greater shielding. In addition, the chassis is divided into five sub-enclosures for maximum isolation of the AVP-8000’s different sections. For example, the digital processing section is located in a copper sub-enclosure to keep its radiated noise out of the analog and video circuits. The entire front-panel display and electronics are similarly isolated. The unit uses what looks like a higher-quality printed circuit board material than is usually found in A/V components. You even get a 3/8-inch-thick machined front-panel. Very impressive indeed. Denon’s matching POA-8200 2-channel and POA-8300 3-channel power amplifiers are similarly well-made, with high- quality parts and what appears to be excellent design. The amplifiers are totally discrete (no integrated-circuit op-amps) for better sound, and feature a nearly du al-monaural design. Each amplifier channel has its own output stage and is fed from separate hefty power transformers and audio-grade filter capacitors. This modular design has another benefit besides isolation between channels: the POA-8300 is simply the POA-8200 with an additional modular channel for 3-channel operation. The amplifier features such high-quality parts as metal-film resistors, film capacitors, and oxygen-free copper wiring. A small cooling fan on the rear panel automatically turns on when the amplifier starts to get hot, something I never noticed during normal movie watching. The POA-8200 and POA-8300 are rated at 120 Wpc into 8 ohms (20 Hz—20 kHz, 0.02% THD; and 200 Wpc into 4 ohms (1 kHz, 0.7% THD). Although no mention is made in the specs that this power is available with both channels driven, I assume it is because each channel is sup plied by its own power transformer. I evaluated the AVP-8000 and POA 8200/8300 as a package, and also tried each product with other A/V preamp/ tuners and power amplifiers. Source components included a Sony MDP-600 laser- disc player and AC-3—equipped Yamaha CDV-W901. The system drove an Infinity Compositions speaker package, which was sometimes augmented with a KEF AV1 THX-certified subwoofer to experiment with the AVP-8000’s sub- woofer output controls. Loudspeaker cables were Monster MC3F HT to the front and Monster SuperFlat to the surrounds. The video monitor was a Sony KP-46XBR 46-inch rear-projection TV. I also tested the AVP-8000 and POA 8200 in my reference-quality music-only system, putting the AVP-8000 in and out of the signal path to hear its effect on high-resolution musical signals. The POA-8200 drove the current-demanding Avalon Radian HC loudspeakers to see how it would handle a difficult loud speaker load. After living with and reviewing A/V receivers for the past year, hearing the AVP-8000 with the POA-8200 and POA-8300 was a revelation. The Denon package was significantly better-sounding than any of the receivers I’ve reviewed on both music and video soundtracks. I was particularly struck by the AVP 8000’s ability to resolve every nuance of music, effects, and dialog in a film sound track. Complex passages that had been a little thick-sounding and congested were presented by the AVP-8000 as clear and well-defined. This was the AVP-8000’s greatest strength; it resolved more information in the soundtrack, yet never sounded etched or aggressive. Lesser products may hype the detail, but quickly become fatiguing. Listening fatigue can be recognized as a sense of relief when the sound is turned down or off—not a good sign. The AVP-8000 not only lacked harshness and edge, I would even call its sound smooth, liquid, and velvety The treble, in particular, was clean and free from the metallic hash common to lower-priced products. The result was a much greater enjoyment of movies than I’ve experienced with A/V receivers. After watching long movies at fairly high playback levels, I didn’t feel worn down the way I do when using less smooth-sounding electronics. I also heard the Denon’s smoothness when auditioning the AVP-8000 in its Stereo mode in the separate music system. The POA-8200 and POA-8300 combo had a similar character: smooth and unfatiguing, yet highly detailed. The Denon amplifiers also had terrific bass, with a tautness and control that rivaled much more expensive amplifiers. When driving the Avalon Radian HCs, the POA-8200 had tremendous bass extension and weight. 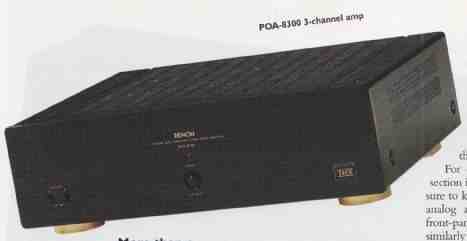 The Denon’s bass was deeper and more powerful than either the Marantz MA500s or the ADA PTM 6150 (see reviews elsewhere in this issue). The Marantz monoblocks, however, had a slightly more open and spacious quality. You must also consider that five MA500s costs $1000 less than the $2500 POA-8300 and POA-8200 pair. I also enjoyed the AVP-8000/POA- 8200/POA-8300’s clarity and ability to keep all the elements of a video sound-track separate from each other. The sound never degenerated into a smeared continuum. Instead, I could clearly hear every nuance without strain. Dialog was more intelligible with out increasing the center-channel level, something I find myself doing with lower-priced A/V receivers. When I tried the AVP-8000 in my system, I noticed that the only AC-3 input was of the RF variety TheAC-3 signal from a laserdisc is RF modulated; in other words, the AC-3 digital bitstream must be stripped off the carrier— or “demodulated”—before it can be properly decoded. There did not appear to be any way to input a straight, unmodulated AC-3 bitstream into the AVP 8000. This is important because the AC-3 bit stream on the upcoming DVD format will not be modulated. Also, moving from straight AC-3 to AC-3 with THX processing takes two keystrokes on the remote (calling up the mode, then moving down a step). That’s fine, but doing the reverse requires cycling back through all the surround modes, a total of 12 keystrokes. And moving from straight AC-3 to AC-3 with THX processing changes the overall level. It measured only I dB, but sounded like more. There is also no apparent way to turn off the on- screen display. That is, if you decide to make a minor adjustment—to, say, the surround level during a film—the appropriate indication flashes on the screen in addition to being displayed on the front panel of the processor. This can be very irritating for others who might be watching. All that said, however, I have to agree with RH that this is a terrific piece. While the price is high, you get a lot for the money. This was particularly true with AC-3 playback. The Denon package was clean and articulate, and smoother sounding than the Yamaha RX-V2090 receiver and its matching DDP-1 AC-3 processor that I reviewed in the last SGHT (Spring 1996, Vol. 2, No. 1). The soundtrack to the AC-3—encoded Outbreak, for example, was reproduced by the Denon package with resolution, refinement, and ease. After hearing the Denon reproduce sever al AC-3 soundtracks (True Lies, Star Trek Generations Outbreak), I’m more convinced than ever of the benefits of AC-3. The AVP-8000’s dynamics were exceptional. The system had a nice sense of dynamic impact and “quickness” that added excitement and realism to music and effects. Transients were sharply defined, but not at the expense of sounding hyped or overbearing. These qualities were enhanced by driving the AVP 8000’s digital input directly from the LD player’s digital out put (when playing Dolby Surround encoded discs, not those with AC- 3, of course, which is always a direct dig ital connection). This step, which bypasses the usual analog-to-digital and digital- to-analog conversion process, greatly improved the AVP-8000’s already excellent sound quality. A digital input is a big plus on any A/V preamp or receiver. The Denon AVP-8000 combines sophisticated features, up-to-the-minute technology (Dolby AC-3 decoding), a wonderful user interface, and terrific sound quality The matching THX-certified POA-8200 and POA-8300 were similarly impressive, both on their own and when used with the AVP-8000. The sound of the package was smooth, clear, and dynamic, without the harshness and edge inherent in most A/V receivers. These qualities greatly enhanced the enjoyment of my home-theater system. In f the Denon package produced the best sound I’ve heard in my home-theater room to date. Although I liked the Denon system more than the Marantz AV600 preamp/tuner and MA500 power-amplifier combination, the $6000 Denon system is considerably more expensive than the $2700 Marantz package. With the Denon, however you’re ready for AC-3—an important factor with DVD just over the horizon. I can’t recommend the AVP-8000 and POA-8200/POA-8300 more highly. If you can make the price jump from run-of-the-mill home-theater components to a truly superlative system, the Denon package is well worth the investment. Measurements were made on the POA-8300.The frequency response, signal/noise ratio, and distortion results were all excellent. Crosstalk was very low. Clipping (1%THD+noise at 1 kHz): 137 Wpc into 8 ohms, three channels driven, 213 Wpc into 4 ohms, two channels driven, and 274W into 2 ohms, one channel driven.